We specialize in installing air conditioners, air-to-air heat pumps, ground source heat pumps, ductless heat pumps, electric furnaces, gas furnaces and radiant floor heating. We do custom sheetmetal orders and also offer options for indoor air quality in your home. These include electronic air cleaners, humidifiers, 7-day programmable thermostats and our custom-built ductwork made right here in our shop to fit your home's needs. Whether you're updating your existing system or building a new home, call us today for a free estimate! Explore our website and learn how you can make your own quality indoor weather! 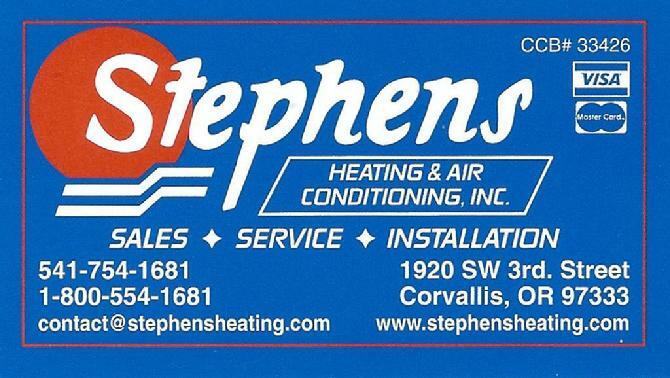 The service department at Stephens Heating is set up to handle gas, propane, electric, even oil. We perform general service and cleaning in addition to tackling difficult problems and tracking down parts from all over the country for our equipment and our customers. Our service technicians are fair and honest people who know that no one wants to pour money into their heating and air conditioning equipment. They'll always give you an objective opinion and treat your system as if it were their own. Interested in applying for employment with our company? Download our application here!